We arrived in Conwy on Saturday at low water. With no water at the end of the jetty, it was a muddy business to launch the dinghy to get wellies from Anyway for the rest of the family. While I was ankle deep, the rest of the family voted to go for a chippie, which meant I would get no chips if the hull was to be cleaned of Barnacles at low tide. The plan was cancelled and once on board, Geke started to cook and I scraped barnacles from the the hull. At 21:00 we attended the NWCC club briefing. 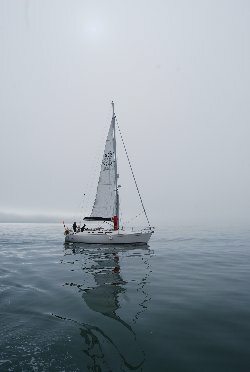 It wasn't a complicated one: We were to set off the next morning at 10:00, sail around Puffin island and be sure to return before 16:00 if one appreciated water under the keel. There would a photographic contest for the best seal picture taken. Comms on channel 72. The next morning we were ready at 10:00 and motored out of Conwy river. HW was at 12:17 at 7.4m. 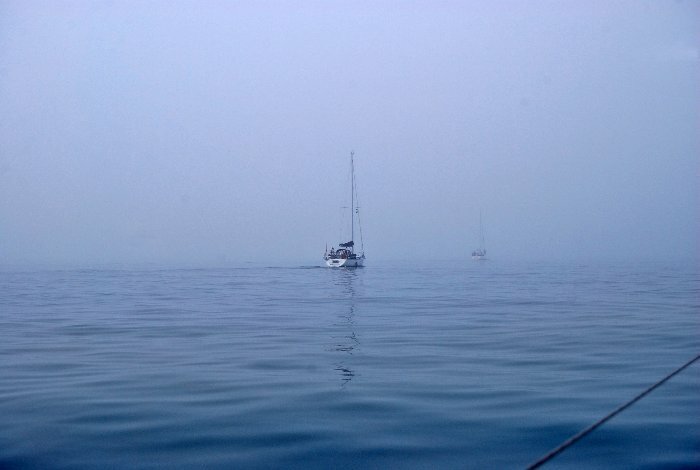 It appeared to be a foggy day with little to no wind. At 11:10 we passed the Fairway buoy. Meryl and Timo stayed in the cabin and we used the autopilot to head for Puffin as it is generally better in concenting on the compass than we are. We headed for the NE point on compass course 292°. At 11:30 the fog got denser with less than 300 meter sight. We used the radar to find Puffin which showed 2.04NM at 11:34. 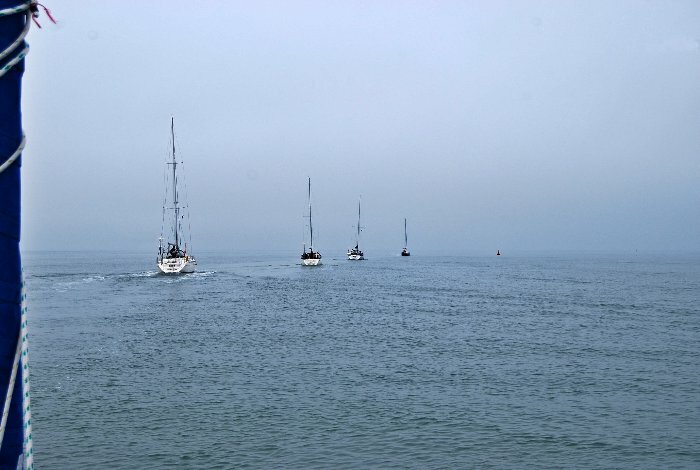 Other yachts did appear on the radar screen occasionally but it was not something to be counted on. We kept a good lookout. In the mean time we were entertained with a lot of hilarious chatter on VHF channel 72 about bikini weather ahead. When we reached Puffin, vision was less than 100 meter. We soon spotted seals and the seals soon spotted us. Meryl and Timo had not been seen outside the cabin but came up quickly to look and take many pictures. 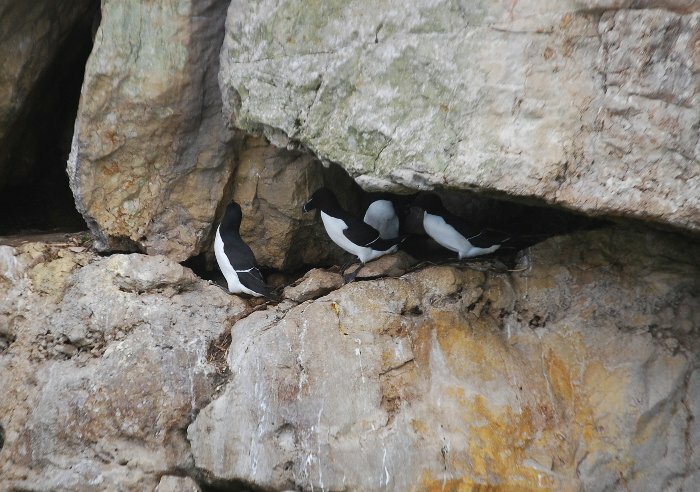 We motored slowly in a NE direction to where Puffin meats the sea and then headed in the opposite direction, closely following the rocky shoreline (at about 7m depth). Promises was the only yacht we saw briefly popping out of the mist. Nobody else was seen after that until we got back in Conwy. No wonder that the photo challenge committee started to check authenticity of pictures taken, as some of us might have never found the island and used Google for glory. 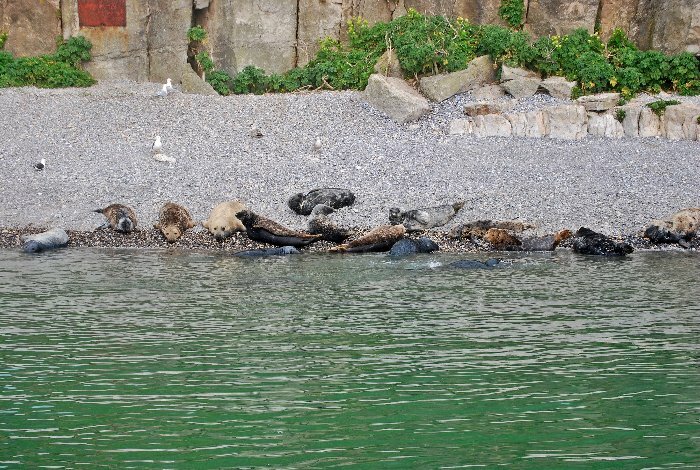 There was a large group of seals on the on the South Western end of the island. At this point we set course (105°C) to Fairlway again as the depth under the keel decreased rapidly to 2.5 meters. It did present a good photo opportunity though. On the return journey there was even a brief moment of wind and the sails were up at 12:45. The kids had a midday snack of noodles and we enjoyed shortbread briefly. At N53° 18.0540, W3° 59.270, we stumbled upon a large set of fishing pods. At 14:55 we were back on our mooring with 2.2 meter water. The trip distance was 17.4 NM. Geke then produced a fabulous late lunch of sausage, bacon, eggs, mini Scottish eggs, bread, crisps and nuts. 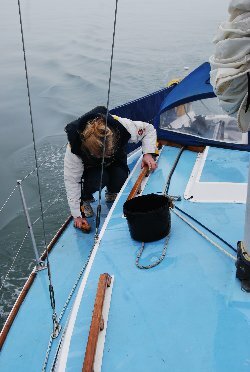 My original plan was to stay behind and start the annual maintenance jobs, but general fear for work and the thought that the harbour office would be closed on Easter Monday (stopping me borrowing the pressure hose) made me change my plans last minute. I would come back a few days later.